« Suddenly, a blizzard of truth from Republicans. Sam Goldwyn Awards* for all three. Revolution in the air in Egypt, Tunisia, Bahrain, Libya, and…Wisconsin? The Wisconsin brouhaha, unlike the others, seems not to have any good guys: EthicsAlarms.com does its usual good job of fairly laying out the good and bad, the credit and the blame. Republican Gov. Scott Walker, the runaway Democratic senators, the public employee unions, and the teachers all have some right and some wrong about their positions. Except the teachers, whose behavior is totally reprehensible. 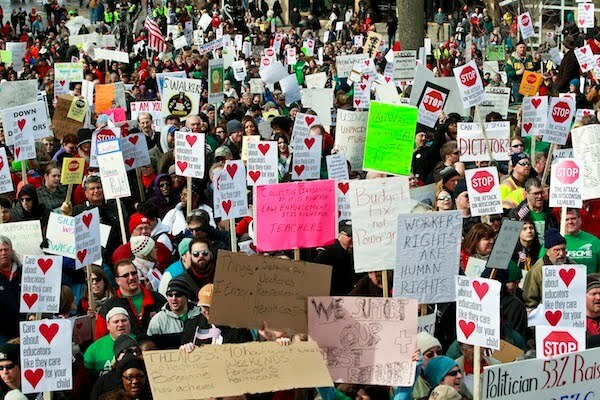 Thousands of Wisconsin teachers, prohibited from striking by state law, falsely claimed to be sick and took days off to demonstrate in the state capital. They scored a twofer, both neglecting their young charges and setting an example that lying to your employer in your own self interest is acceptable. Public servants are under fire all over the US in this time of budget crises. The Wisconsin teachers by their dishonest and irresponsible behavior seem to confirm the worst stereotypes about public employees. When the Boston police went out on strike in 1919, Gov. Calvin Coolidge stood by his commissioner who fired the strikers, famously announcing, “There is no right to strike against the public safety by anybody, anywhere, any time.” When America’s air traffic controllers broke the law prohibiting strikes by federal workers in 1981, President Ronald Reagan fired over 11,000 who had refused to return to work. Coolidge and Reagan showed backbone and the public embraced their actions. Time for the Wisconsin school boards to show their backbone and fire the teachers who lie to their employers and harm the children they are supposed to teach. This entry was posted on February 21, 2011 at 11:39 pm and is filed under Education, Ethics-general, Government, Politics. You can follow any responses to this entry through the RSS 2.0 feed. You can leave a response, or trackback from your own site.